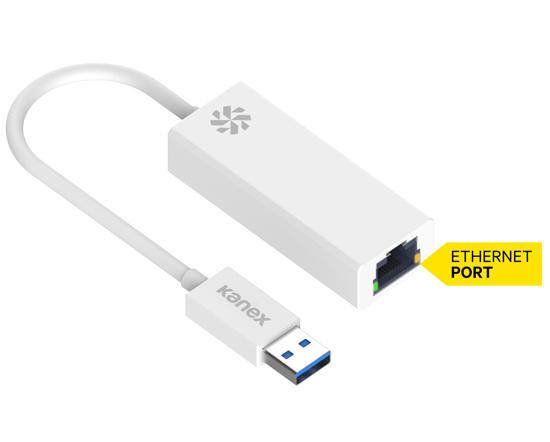 The Kanex USB 3.0 Gigabit Ethernet Adapter adds a Gigabit Ethernet port to your MacBook Air, MacBook Pro with Retina display or any other USB enabled computer. Set-up is easy. After a one-time software installation, simply connect an Ethernet cable to the Kanex USB 3 to Gigabit Adapter then plug into the USB 3 port of your MacBook Air or MacBook Pro with Retina display. Now you’re connected to the network or the Internet! Perfect for business or travel where Wi-Fi is limited such as hotels or conference rooms. This compact adapter is ready to go when you are. The Kanex USB 3 to Gigabit Adapter is bus powered through USB, therefore no external power is required. This versatile little adapter is also backwards compatible with USB 2.0 and USB 1.1 so you’ll be ready for an upgrade when your computer is.